Each year my immediate family gets together for a day of holiday cookie making. I don’t do a ton of baking throughout the rest of the year, but I really, really enjoy this holiday tradition of ours where we spend all day baking far more cookies than we could possibly eat (thank goodness for neighbors and friends!). 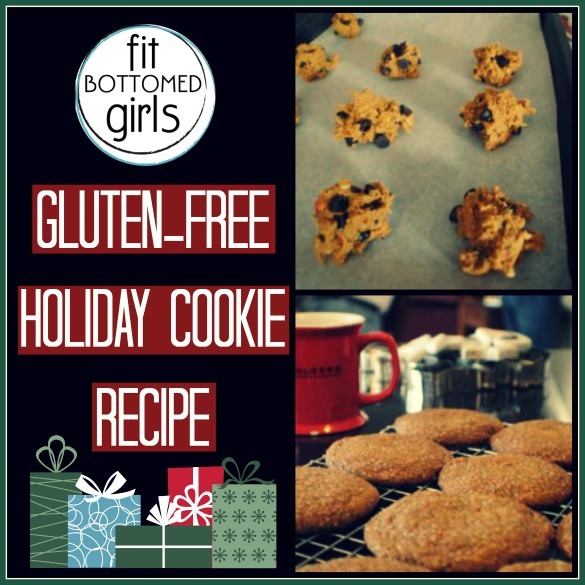 However, this year, our holiday-cookie-bake-a-thon had a fun twist to it—we went gluten-free with most of the recipes. My mom has been following a gluten-free diet since Thanksgiving and, by doing so, has pretty much eliminated severe stomach issues she had earlier this fall. Being that I a) want my mom to feel good and b) am always a sucker for a challenge—especially one where you can try new fun ingredients, this year’s day of Christmas festivities was an exploration in gluten-free baking. Sure, I’d made these cookies once, but it was just for a review. This was the real-deal, man! So, like any good blogger, I hit up Twitter and gluten-free-living blogs for some recipes. After searching through many great suggestions, I settled on Gluten-Free Soft Molasses Cookies from Gluten Free Girl and Quinoa Pumpkin Cookies from Gluten Free Goddess. I liked that both were festive, not overly complicated and yet also unique (the molasses cookies called for a decent amount of spicy fresh ginger and the pumpkin quinoa cookies used coconut oil as a replacement for shortening—l0ve). Up first? 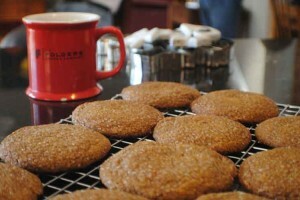 The Soft Molasses Cookies. This recipe called for most of the ingredients in grams. 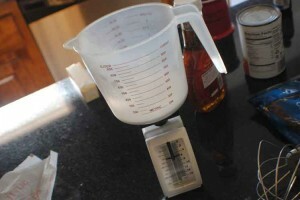 I guess this is because with gluten-free baking and all the different kinds of flours out there (more on that later) that you can use, it’s more accurate to use weight than a cup of this or a cup of that. So out came my food scale. I’ve had this since my (thankfully former) obsessed calorie-counting days. Glad it came in handy for a more noble purpose! After mixing everything together (flour, eggs, molasses, etc. 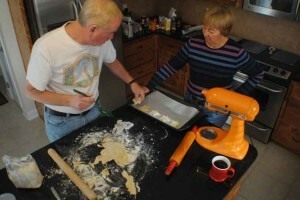 ), the dough had to chill, so we whipped up gluten-free cookie recipe No. 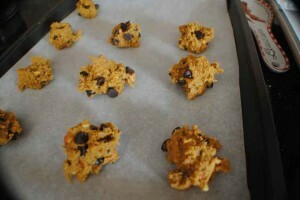 2: The Pumpkin Quinoa Cookies! 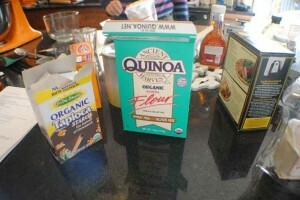 I already love quinoa, so I was psyched to use quinoa flour. (I couldn’t find flakes, which the recipe calls for, at my local Whole Foods. Darn!) 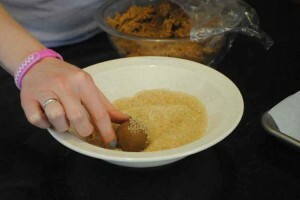 For this one we also used coconut flour, brown rice flour and tapioca starch. All three were totally new ingredients for me. Whee! We dropped them by the big spoonful on baking sheets lined with parchment paper and boom, gluten-free cookies that tasted a little coconut and a lot filling with chocolate chips, raisins and chopped almonds. Next it was time to roll out the sugar cookies and gingerbread. Now, my dad is the man when it comes to rolling dough out. So, we let him do his thing. 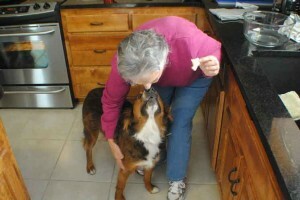 Then my mom (shown below) and I decorated the heck out of them. Once coated, you flatten them out a little and then bake them to soft perfection. Quite the ta-da and seriously delicious with a cup of coffee. Overall, I really enjoyed my first gluten-free baking experience. While I don’t have as serious of a gluten-sensitivity as my mom does, I do feel better when I don’t eat too much gluten. Sure, we had to weigh some ingredients and some of the flour costs triple what we’d pay for normal wheat flour, but it was fun. I felt better eating higher-quality ingredients (everything we bought was organic and seemed to have more vitamins and minerals than regular flour), and it was fun to try new funky things (garbanzo bean flour—surprisingly normal now!). My mom didn’t miss out on any of the holiday baking fun and—to tell you the truth—no one could even tell that the cookies we made were gluten-free. Heck, even the sugar cookies where we made a half batch regular and a half batch gluten-free were both equally delicious. So the fact that we can get together for our holiday cookie baking day (or any holiday really) and no one feels deprived or left out is a huge win for the fam. I’m actually kind of excited to see what other gluten-free recipes I can try! Awesome Jenn. They look deLISH! Thanks for the recipe. Will try them for the holidays. 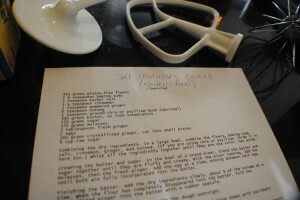 My son’s gluten-free and I’ve tried tons of cookie recipes over the years. Hate to say it, but it’s hard to beat the Betty Crocker mixes. 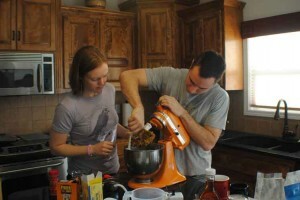 Their website, http://www.glutenfreely.com, has recipes to add variety. I can serve them at a party and no one notices that they’re gf. I know they’re not the healthiest option but sometimes you need a cookie to be a cookie.